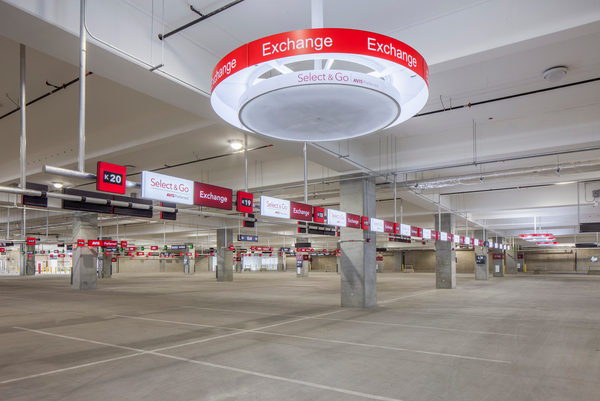 An Austin/Sundt Joint Venture has completed San Diego International Airport’s $316 million rental car center, giving travelers a quicker and more convenient way to grab a vehicle and hit the road. The Construction Manager at Risk project shifts rental car facilities to a centralized location on the north side of the airport. The project is a 2 million-square-foot structure that houses companies representing 16 brands, a customer service building, quick-turn-around car prep facility and ready/return area for more than 5,400 vehicles. The center is the first major component of the airport’s long-range plan to reduce traffic congestion and bring passengers closer to Interstate 5 and commuter rail lines. Designed to achieve LEED Silver certification under the U.S. Green Building Council program, the facility helps improve air quality by cutting the number of shuttle vans from 81 to 16. 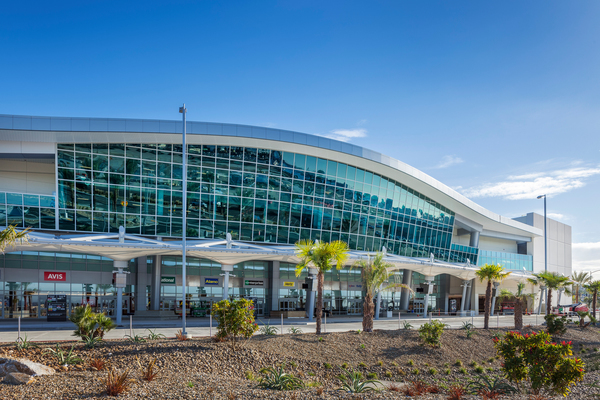 “This facility provides environmental benefits to the whole community, strengthening the airport’s role as an economic engine for the entire region,” said San Diego County Regional Airport Authority Board Chair Robert Gleason. The center has two customer lobbies, five interior and exterior public art installations, and space for a restaurant that will seat about 300 people. It uses an innovative “mini-mall” concept for rental car companies. Sundt’s aviation experience enabled the team to better serve the client. The company has made improvements at airports in Austin, Texas; Wichita Falls, Texas; and Tucson. Sundt crews also performed work on Terminal 2 in San Diego. The team faced restrictions on work hours and equipment height. Crews needed to exceed height limits to erect the precast façade of the building. “We obtained additional FAA permits to allow a higher limit and coordinated special requirements for how the crane had to be stored during non-working hours,” said Project Manager Jared Mettee. The little details were also covered. Since passengers will have baggage and carts, the team used more durable baseboards and rails with finishes that don’t show wear as quickly. “We understood that you don’t just have people walking around,” Mettee said. 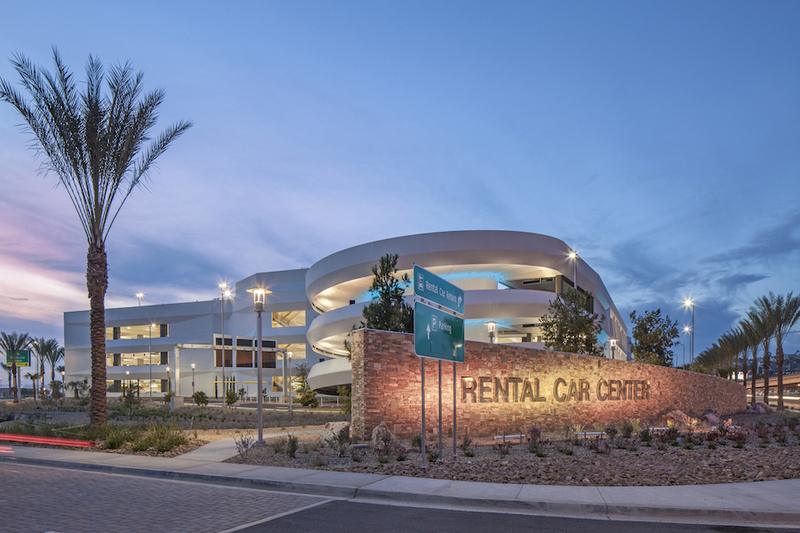 The company’s previous experience at San Diego International was a benefit, enabling the team to help coordinate art installations in the rental car center around construction activities. The team’s skilled crews placed 97,500 cubic yards of concrete on the 24-acre site, enough to build a 362-mile sidewalk from San Diego International Airport to Sky Harbor in Phoenix. Concrete was placed in 12 months – the equivalent of pouring about an acre a week. The center is the largest concrete building in San Diego. Constructing it required 3,000 craft employees and 169 trade partners. It was designed by Demattei-Wong Architecture. Completing the project gives Sundt a track record to go after even bigger things. 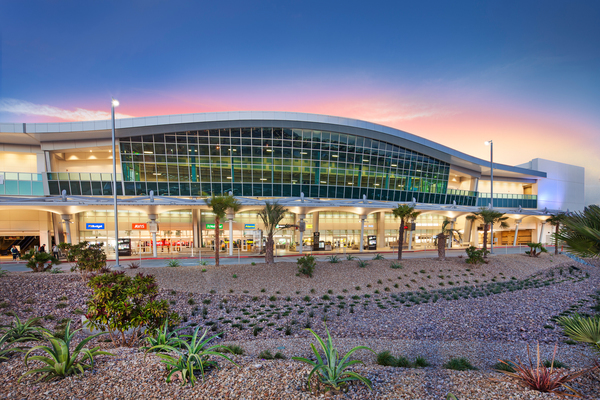 “This project has been so successful that the Austin/Sundt joint venture is now pursuing the planned consolidated rental car center at Los Angeles International Airport,” said Executive Vice President and Regional Director Jon Wald. “It will be three times the size of San Diego, and will accommodate approximately 21,000 cars. It will be the largest rental car center in the country. 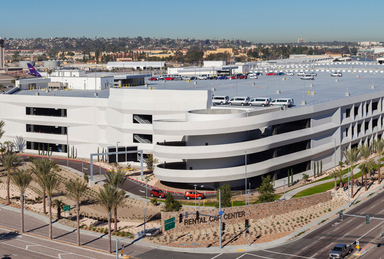 The new consolidated rental car center at San Diego International Airport is a massive two-million square-foot structure that houses 12 rental car companies, a customer service building, a quick-turn-around car prep facility and a 5,400-car ready/return area. The project was the first major component of the airport’s long-range plan to reduce airport traffic congestion and bring passengers closer to Interstate 5 and commuter rail lines. The new facility is helping to improve air quality by removing multiple shuttle vans from the streets (going from 81 to just 16) and greatly simplifies the trip to and from a single, centralized rental car lot for passengers. Sundt’s joint venture team placed 97,500 cubic yards of concrete on the 24-acre site – enough to build a 362-mile sidewalk from San Diego International Airport to Sky Harbor in Phoenix. The concrete at the rental car center was placed in 12 months, the equivalent of pouring about an acre a week. The center is the largest concrete building in San Diego. Constructing it has required 3,000 craft employees, 169 trade partners and almost 1.2 million work hours to date.